This article shows you how to move the iPhoto Library folder or Library package to a new location. Note: The iPhoto library in iPhoto '08 or later is called a package. The iPhoto Library folder or package contains imported photos and any albums you've created using iPhoto. If you want to move your iPhoto Library folder or package to a new location, you must move the entire folder or package and then identify its new location in iPhoto. The following steps only apply to iPhoto 2 and later. For iPhoto 1.1.1, refer to iPhoto 1.1.1: How to Move the iPhoto Library Folder to a New Location. Note: If you move, delete, rename, or change files or folders in the iPhoto Library folder, you may be unable to see your pictures in iPhoto. Open your Pictures folder and select the iPhoto Library. Drag the iPhoto Library folder or package to its new location. If you are using iPhoto '08 or later, you can double-click the iPhoto Library icon in its new location to open iPhoto. iPhoto will remember this new location in the future. Hold down the Option key on the keyboard and open iPhoto. Keep the Option key held down until you are prompted to create or choose an iPhoto Library. Locate and select the iPhoto Library in its new location. Learn how to move your iTunes Media folder to a different location on your Mac. If your hard drive is nearly full after you load your media into iTunes or you want to move your media files to another hard drive, follow these steps to move your media and keep your playlists, ratings, and play history. 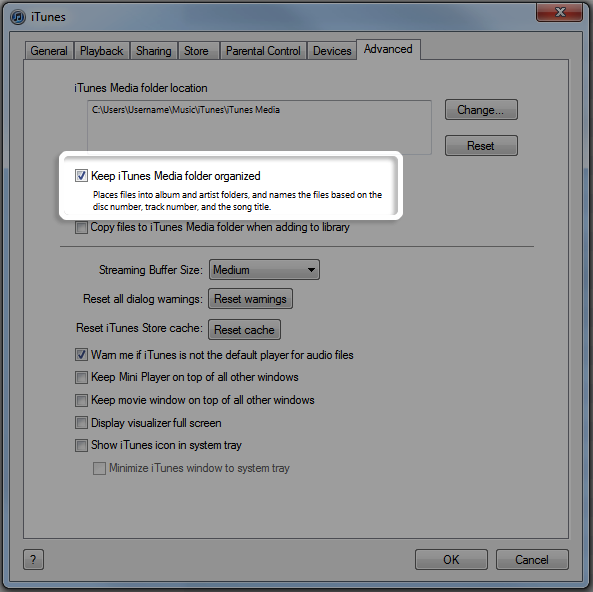 Follow these steps to move the iTunes Media folder on a Windows PC. If you created your iTunes library using iTunes 8 or earlier, the iTunes Media folder may be called "iTunes Music." Select "Keep iTunes Media folder organized." Note: If you move your media to an external hard drive, you must connect that drive to your computer to access your files. Remember to back up the media you have in iTunes. Click the Change button in the "iTunes Media folder location" pane. The Change iTunes Media Folder Location window appears. Note: Your iTunes Media folder is named "iTunes Media" in ~/Music/iTunes/ (the tilde ~ represents your home directory). Click the New Folder button in the Change iTunes Media Folder Location window. The New Folder window appears. Enter the name of the new iTunes Media folder. Click Open in the Change iTunes Media Folder Location window. iTunes 9 or later: Choose File > Library > Organize Library. iTunes 7 or iTunes 8 for Mac: Choose File > Library > Consolidate Library. In the Organize Library (or Consolidate Library) window, select "Consolidate files." Important: All of your media files should copy to the new location. There must be enough hard disk space available to copy all of your media files. After the folder copies, find your original iTunes Media folder and drag it to the Trash. Important: Keep the iTunes library files that may be in the same location as the iTunes Media folder. Learn about the iTunes library files. Quit iTunes and open iTunes again. If you see the alert "The folder containing "iTunes Library" cannot be found, and is required. Please choose or create a new iTunes library," you may have moved the iTunes library files. You should move them out of the Trash and back to where they were. If you can open and close iTunes without seeing the alert, empty the Trash. 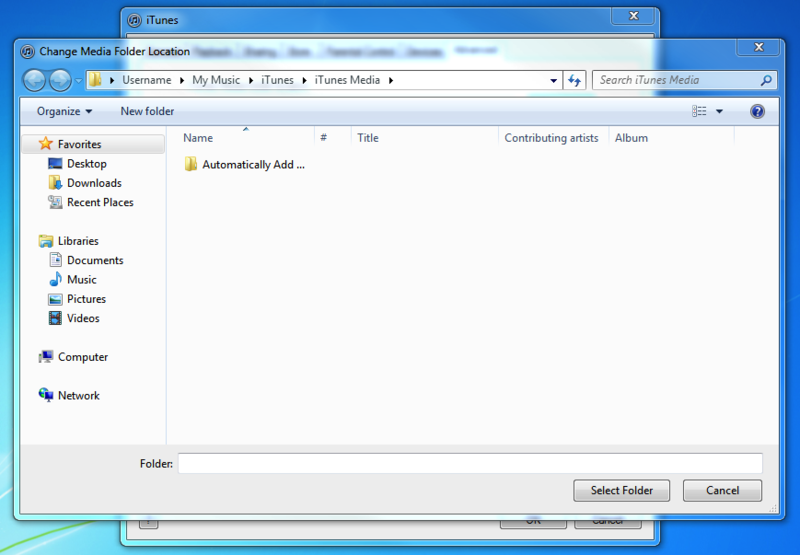 Learn how to move your iTunes Media folder to a different location on your Windows PC. To move the iTunes Media folder on a Mac, see iTunes for Mac: Moving your iTunes Media folder. If your iTunes library was originally created using iTunes 8 or earlier, the iTunes Media folder may be called "iTunes Music" instead. If your hard drive is nearly full after loading all your music and other media into iTunes, or if you just want to move all those music and media files to another hard drive on your system, here's a way to make the move while retaining all your playlists, ratings, and play history. Select the "Keep iTunes Media folder organized" checkbox. Once you've done that, follow the next set of steps to change your iTunes Media folder location to the new drive and then consolidate your library to the new location. This not only copies your audio and media files over, it also retains your ratings and playlists. Note: If you move your library to an external drive, you'll need to power up and connect the drive before starting iTunes. If you don't, iTunes will prompt you to either locate the library or to create a new library (which will result in an empty library). No matter what, it's always a good idea to have a backup of the media you have in iTunes. Click the Change button in the iTunes Media folder location pane. In the Change Media Folder Location window that appears, navigate to the location where you would like your new Media folder to be created. Click the Make New Folder button in the Change Media Folder Location window. Click OK in the Change Media Folder Location window. Click OK in the Advanced window. A message will pop up. Place a check next to "Consolidate files" and click OK. Important: This action copies all of your music and other media files to the new location. There must be enough hard disk space available to copy all of your files. 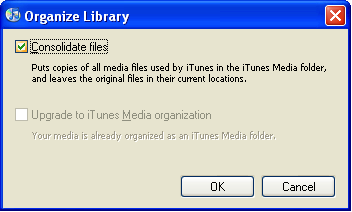 After the folder has been copied, locate your original iTunes Media folder, and drag it to the Recycle Bin. Important: Don't remove the iTunes Library files that may be in the same location as the iTunes Media folder. For more information about the iTunes Library files, see What are the iTunes Library files? If you receive the alert: "The folder containing "iTunes Library.itl" cannot be found and is required. Please create or choose an iTunes library," you most likely moved the iTunes Library files. If this is the case, move them out of the Recycle Bin and back to where they were. If you do not encounter the above alert when opening and closing iTunes, empty the Recycle Bin. f your Apple Mail doesn't seem to be searchable and/or has become so slow it seems to hang your Mac -- or even displays incorrect email content, then it's time you attacked the problem: it's time to rebuild and reindex your Mailbox. Mac users depend on Apple Mail for day-to-day email use, but as those messages come in and go out your Mailboxes will become bloated. When they do, Mail's performance will suffer and you'll find that even something as simple as downloading new messages takes an age. Rebuilding a Mailbox in Mail sound daunting but it really isn't. Launch Mail, select one of your mailboxes and click on the Mailbox menu. At the bottom of the pane choose the Rebuild option. If you have a large mailbox, you can expect the process to take a few hours. You must repeat this step for each one of your Mailboxes. While the process takes place, you may experience system performance lag, as it can consume a lot of system resources and memory. Another caveat, if you use IMAP or Exchange with any of the accounts, the process will redownload every message from the server, so you'll use a lot of bandwidth. Now that you've completed these steps, work with Mail a little longer. If you are still having issues, or Mail fails to launch, you should try a manual reindex. Manual reindexing of Mail messages is the only way to go if the application has become so unresponsive it barely works at all, search is not functioning correctly or the app won't launch. Mail will automatically attempt to reindex your messages if it detects problems with the mailboxes, but sometimes a manual reindex is the best option. If you are still having problems with Mail after following step one, try manual reindexing. To get to your home Library folder, hold down the Option key, then in the Finder choose Go > Library. Launch Mail and the app will build new Envelope Index files -- this can take a long time if there are numerous messages to go through. If everything seems to be working correctly, you can now delete the copies of the "Envelope Index" files from your desktop. In most cases, these two tips should solve most Mail problems -- I hope they help resolve yours. After upgrading to OS X Yosemite, you might find Apple's Mail application may crash or hang when you open it, preventing you from accessing any new messages. This can be exceptionally frustrating to manage, especially when it persists after restarting your system. If mail is constantly quitting after upgrading, and especially if it quits immediately when you open it, then there are several approaches you can take to fix this situation. When you open Mail, the program will show the last Mail message that you had selected, and if this message contains errors or corruption that is causing the crash, then this may trigger Mail to always crash when opened. To bypass this and have Mail not select any mailbox or message to show when launched, open the program and immediately hold down the Shift key until Mail is opened. If this causes the program to launch successfully, then you can investigate which messages or mailboxes are causing the issue. Another approach is to boot OS X itself into Safe Mode by restarting and holding the Shift key down immediately when you hear the boot chimes. This will only load essential features of the operating system, and while you should expect it to run noticeably slower in this mode, it may allow Mail to load properly when launched. If this occurs, then reboot normally and try Mail again. Go to the Internet Accounts system preferences, and then uncheck the Mail option for each account you have listed there. When all are unchecked, open Mail to see if it will launch correctly. 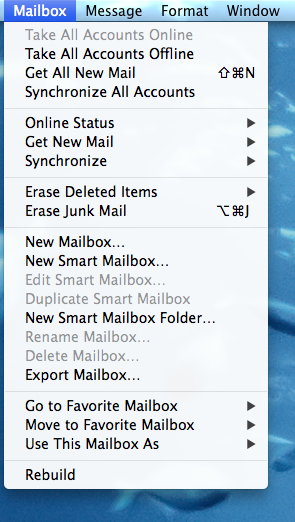 Then quit Mail, re-enable your Mail accounts in the System Preferences, and try opening the program again. If you have any third-party programs that interface with Mail, then uninstall them. These can be password managers, or junk mail filters, content managers that will handle attachments, or security software for encrypting messages and connections. Sometimes these programs may simply not be updated to work with the new version of Mail, or may just be experiencing a temporary hiccup that will benefit from a reinstallation. If you are uncertain if you have any such programs installed, then try going to the Library > Mail > Bundles folder and remove any items in it. There are libraries in OS X that have instances of this folder. The first is the global one at the root of your hard drive (Macintosh HD > Library), and the second one is the one in your user account, accessed by holding the Option key and choosing Library from the Go menu in the Finder. Mail is a sandboxed application in OS X, meaning that like many other applications it and its resources are isolated from other processes for security and stability reasons. As part of this setup, OS X will create a virtual container in which the program accesses the system resources it needs, and does so by accessing parts of the OS X filesystem through a special directory tree in your account's library. This directory tree primarily contains aliases, but also contains files specifically for Mail, such as its preference and cache files. If you remove the container for Mail, OS X will simply rebuild it and have Mail re-create the files it needs; however, doing so will clear out settings contained in these files, requiring you to set these up in Mail again. These can include mail accounts, signatures, smart mailboxes, and mail filters, so if you remove and rebuilt Mail's container, expect to set these up again. With this in mind, before clearing Mail's container, be sure you have a full backup of your Mac. Then access the Go menu in the Finder with the Option key held down, and choose the menu item called "Library" that appears. In the Library folder, go to the Containers directory and move the folder called "com.apple.mail" to your Desktop (so you can restore it easily, if needed). After this, re-launch Mail, configure your e-mail accounts and other settings, and you should be up and running again. Again, because of potential complications with setting up Mail, use this option after you have tried all others, after you have created a full backup, and only do so if you cannot get Mail to launch properly by any other means. UPDATE (10/20/2014): Added information about removing Mail's container as an option. We should first emphasize that you should always make a full backup on your own computer of everything related to your mail programme before making any changes. Be sure to include messages and settings. With the Apple Mail application, if a POP3 mailbox (an "account") is deleted, it removes all messages associated with that mailbox, deleting them from your computer  which may have the only copy of a message if you're not also storing them on our servers! There are two kinds of mailboxes in Apple Mail  ones that sync with an associated email server (these will be your inbox, sent items, trash, drafts and junk) and "On My Mac" mailboxes that only exist on your Mac. To ensure that you don't lose your email data when we delete your old email account copy all messages into an "On My Mac" mailbox before we delete your account (Note: your account will only be deleted on the day of migration). Now starting with your inbox, select all the messages. Drag them to '1 inbox' under On My Mac. Do the same for sent items, dragging them to '2 sent', Trash to '3 trash', drafts to '4 drafts' etc. Continue to do this on a regular basis up until the date of your migration. In doing this, it will help to save time and improve the process when we switch your accounts over. See the given steps to understand how to import eml files into windows live mail. The given instructions clearly explains the complete process to import and find location of Window Live Mail Store. So, don't worry if you have to import EML into Windows Live mail. As well as you can find out "Where does Windows Live Mail store messages" and "Where does Windows Live Mail store contacts". Here you can find solution for both. Open the Window Live Mail client on your system. Click on Browse button. See the emails. Click on Next button. Either select all folders or a specific folder and then click on Next. Folder will start exporting. Click on Finish. Open Windows Live Mail, Select Tool > select Options. In Option Window, click on Advanced Tab and then click on Maintenance button. In the Maintenane Window, Click on the Store Folder. Now you can see the Store Location. Outlook 2011 had a proprietary database format and we (as users) had very few options to work with it. Outlook 2016 now uses a sqlite3 databases for its identity (just like Mail). While there is very little we can run from the app itself in terms of maintenance or troubleshooting, in theory we should be able to tap straight into the database through sqlite3 itself. 1) BACKUP the database before anything. That are in the ~/Library/Group Containers/UBF8T346G9.Office/Outlook/Outlook 15 Profiles/Main Profile/Data folder. 2) QUIT Outlook. You can't run anything safely on the identity if it's still in use in Outlook itself. /usr/bin/sqlite3 ~/Library/Group\ Containers/UBF8T346G9.Office/Outlook/Outlook\ 15\ Profiles/Main\ Profile/Data/Outlook.sqlite "PRAGMA integrity_check"
If everything is fine, the Terminal will return "OK"
If you get a warning there, then obviously something in wrong in the database. In theory, Outlook should detect issues and automatically attempt to fix them, but there are been reports in the forums of identity failures and users no longer able to open up their identities. It might be worth attempting other "rescue" operations in these cases using additional commands like ".dump" etc. (which is beyond the point of this post: search for your favorite sqlite How To or Forum page for additional information on how to repair a corrupted sqlite3 database). - A number of websites have illustrated how "vacuuming" the envelope index could help speed things up and trim the database in Mail. I figured that the same should apply to Outlook too. I ran the command in Outlook and the database shrunk a bit. No problem within Outlook whatsoever on my Mac, but who knows... (hence the very very strong suggestion to make a backup). "Vacuuming" will rebuild the database file, reclaiming free space and defragmenting tables and index. I'm not sure whether Outlook is currently using auto_vacuum or not, but I have read reports of abnormally large Outlook database files which makes me suspect it's not always taking place as it should if it is even enabled. Outlook 2011 brings much better Exchange connectivity to the Mac than was experienced before its release. It behaves much more like the Outlook for PC than Entourage did. It requires Exchange 2007 or better, with Exchange 2010 or better recommended. The above items conspire to make it a less than ideal choice. It is, however, the best of the lot out there. Below are some details regarding the issues we have seen at our university and some of the fixes or ideas that can be used to address those issues. - Minimum should be a fast DSL connection, with even that causing an identity creation taking many hours as it gets into the tens of gigabytes in size. - Consider downloading the message headers only if Outlook takes a long time to get or open messages. Regardless of the above notes about size, the real issue is the number of items, not the total size in bytes. Although a 20+ GB database is indeed huge, having it made up of a lot of small emails can be harder on the system than if it were fewer, larger emails. Ideally, keep the Inbox, Contacts and Calendar to 1000 items or less. According to several sources, the totals should be kept to no more than about 2500 - 5000 items in any of the critical path folders, namely Calendar, Contacts, Inbox, and Sent Items folder. I consider 5000 to be in the danger range, based on personal experience with Concordia clients and recommend an upper limit of about 2500 or so. Having a large number of items in a folder will mean than operations in that folder will take longer, such as adding a new column to the view, sorting on a new column, finds and searches. Do NOT nest folders inside the Inbox. Place all those user-created folders at the same level as the Inbox. The user-created folders can contain sub-folders, although the greater the number of those can in turn add overhead to the system. Make use of the export functions and the local storage afforded by the computer itself, if that is the only way to keep the bloat on the exchange server down to reasonable levels. It will mean that, like the PC, the mac user will be responsible for local backups but that is the price of keeping every single piece of email ever received or sent. Outlook shows similar folders grouped together, such as all Inboxes, by default. Presumably such a setting is viewed as a convenience. The problem is that it hides the true size and folder complement of the mail accounts from the user. As well, it opens the door to moving folders from one account's inbox to another by accident. If, instead, we turn off that feature and view each account as separate entities, their true scope is then seen in one nice chunk. It also eliminates accidental moves from account to another. The feature is located in the "General" tab in the Preferences. The user's quota is not reported fully from within Outlook 2011. As with previous generations of Outlook for PC, it is only possible to get the size of a given folder, including the parent Mailbox folder itself. What is NOT available is the actual quota limit, something that is now easily done on a PC. That feature was added in PC Outlook 2010. Furthermore, it is not a good idea to assume that the user has your institution's default quota. There might already people with wildly differing quotas. The differences could grow as people in your organization begin to use the new system more aggressively. 2) Place the mouse over the mailbox name in the folder list. The quota will appear in a message box. The identity in Outlook is where the entire mail environment is stored for that user. The database is part of that identity and contains the actual mail and attachments. Like any database, the file(s) involved need cleaning and fixing on occasion. Should Outlook freeze upon launch, the usual culprit is the database. Rebuilding via the Database Utility is the usual fix. However, with Exchange only environments, another option is open to us. Assuming all the mail is on the server, it is often better to simply start from scratch. Using the Database Utility, one creates a new identity and points Outlook to that. Then one starts Outlook and creates the accounts all over again. The previous identity can be kept for any mail stored locally. Better still would be to combine the export feature to create '.olm' files (Mac's '.pst' ) and simply re-import the data after making a new identity. Keeping the critical areas of the server's Mailbox lean and clean as detailed above seems to go a long way in solving server based mail issues. For those who insist on keeping everything, encouraging archiving of some sort or another is the only alternative. 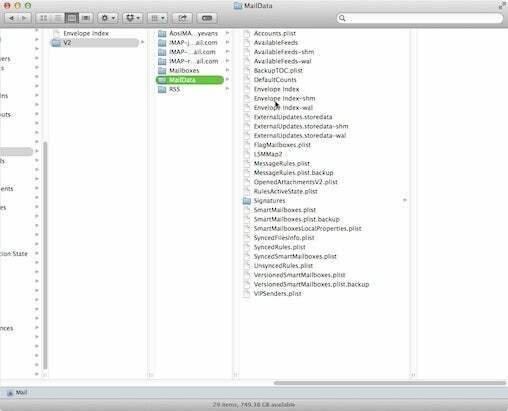 - Keep the number of items in the critical folders to a minimum. - Keep the number of plug-ins to a minimum. - Organize your email into a structure that facilitates both productivity and archiving. - Do NOT group similar items, forcing Outlook to display each account as a fully separate entity. - Downloading headers only is an option should Outlook still perform slowly. - Rebuilding is not always the way to go. COPY these Data Records folders from the old Identity to the new blank Identity replacing the new identity folders. Do NOT replace the root Data Records folder. Only the sub-folders listed here. Select to rebuild the new Identity in database utility; ignore any message that tells you that you need to rebuild your database while the database utility is working. Most resources neglect to tell you to drag the new identity database to trash before you copy over the old identity records. Also, they may tell you to copy over the old identity folders records instead of the categories records, but don't as that is likely to cause a problem; it did for me. Is Antivirus software running? Is Windows Desktop Search Indexing? Is Outlook reconciling the OST or PST file following an issue? Please see related page for further information on these topics. Antivirus programs and personal firewall programs can change or remove packets, rewrite files on disk, or alter the memory of running programs. All of these can cause problems for Outlook. Disable any antivirus programs and personal firewall programs. AVG AntiVirus is known to cause problems with Outlook and the Outlook Connector. You need to disable the email scanning portion of AVG antivirus for Outlook to work properly. On most versions of AVG, the systray icon will change to a gray color when this is done. The Google Desktop Search can cause excessive memory use and hangs when used with the Outlook Connector. You should uninstall it to confirm that it is causing your problem. If it is not the cause, you may reinstall it. Are you running the latest version of Outlook 2010? Note that KOFF has its own built-in searching, and does not depend on the Outlook Instant Search feature. In Outlook 2003 and above, there is an option to show emails in groups. If you find that folders such as the 'Sent Items' take an excessive time to load, it is recommended to disable the 'group by' view, which is the view option, 'Show in groups'. Do you have a large .pst file or .ost file? Up to 5 gigabytes (GB): This file size should provide a good user experience on most hardware. This is a stop-gap solution and is provided here for reference if you cannot reduce the size of your mailbox. For example, you may be unable to reduce the size of your mailbox if you have to maintain an archive of all email messages, both sent and received, over a time span of several years. Do you have many items in a single folder? If you have lots of items in any single folder, you may experience performance issues during certain operations in Outlook while you use local data files. If you use Outlook to connect to a mailbox that is located on a Microsoft Exchange Server and use Cached Exchange Mode, Outlook synchronizes email and other items to an Offline Outlook Data (.ost) file. If you use Outlook to connect to other email accounts, such as POP3 or IMAP, Outlook stores email and other items to a local Outlook Data (.pst) file. These performance issues are especially noticeable when you switch into and out of folders that contain a large number of items. If you have more than 50,000 items in a single folder, views other than Arrange By: Date can be slower. We recommend that you move several items in these larger folders to separate folders in the same store or to an archive store and that you use Arrange By: Date when you run Outlook 2010. If you are not using Cached Exchange mode, you should review one of the following resources. These resources document some performance issues on an Exchange server that has high item counts and restricted views. Additionally, the resources discuss how these performance issues might affect the overall client user experience. Do you have any nonessential add-ins or out-of-date add-ins installed in Outlook? Click Options, and then click Add-ins to display a list of the COM add-ins that are installed. Any other add-ins that are listed under COM add-ins were installed by other software. To determine whether the performance problem is caused by add-ins, run Outlook in safe mode. To do this, press and hold Ctrl when you start Outlook. When Outlook starts in safe mode, all COM add-ins and Exchange Server client extensions are disabled. If the problem no longer occurs when Outlook is running in safe mode, it is likely that one of the add-ins is causing the performance issue. To troubleshoot possible problems that are caused by COM add-ins or Exchange Server client extensions, disable any items that you do not use regularly. Then, restart Outlook. If that does not resolve the problem, disable the remaining add-ins one by one. If that does not resolve the problem, the issue may not be caused by an add-in. Select COM Add-ins in the Manage list, and then click Go. In the COM Add-Ins dialog box, click to clear the check boxes for any COM add-ins that you want to disable. 2. Go to Control Panel -> mail -> accounts -> Kerio properties -> maintenance -> clear cache. 3. Re-create the offline Outlook Data File (.ost). See related article if you're unsure how to do this. Your Microsoft Outlook mailbox grows as you create and receive items. To manage the space in your mailbox or on the mail server you are using, you can move old items that are important, but rarely used, to an archive location. This storage process occurs automatically with AutoArchive, but you can customize most of the default settings. For further information please see related article. The Outlook profile is a frequent cause of problems. Many problems can be resolved by creating a new profile. Open Control Panel -> Mail. Open "Show Profiles". You will see a list of your current profiles. Set "When starting Microsoft Office Outlook, use this profile" to Prompt for a profile to be used. Please make sure that you set "Default Delivery Location" to Kerio Outlook Connector Store. This is critical for Kerio Outlook Connector to function properly! Do not create additional POP3 or IMAP accounts in this profile. This is not supported. Note: When you create a new profile, you will not lose any mail, calendars or contacts. Your original profile will continue to be available. Your profile-specific settings will not be available in the new profile; these include default views, sorting options, and distribution lists. If your Microsoft Outlook Data File (.pst and .ost) won't open or you suspect that the data file is damaged, use the Inbox Repair tool (Scanpst.exe) to diagnose and repair errors in the file. The Inbox Repair tool checks the Outlook Data Files on your computer to see if they're in good shape. Exit Outlook, and browse to <drive>:\Program Files  or, if you see a Program Files (x86) folder on the same drive, browse to that instead. For example, C:\Program Files or C:\Program Files (x86). If the search doesn't find Scanpst.exe, try searching in the alternative folder mentioned in step 2, above  Program Files or Program Files (x86). In the Enter the name of the file you want to scan box, enter the name of the .pst file you want the tool to check, or click Browse to select the file. By default, a new log file is created during the scan. Or, you can click Options and choose not to have a log created, or to have the results appended to an existing log file. If the scan finds errors, you're prompted to start the repair process to fix them. The scan creates a backup file during the repair process. To change the default name or location of this backup file, in the Enter name of backup file box, enter a new name, or click Browse to select the file you want to use. A copy of the log file is saved to the same folder as the .pst file. Start Outlook with the profile that contains the Outlook Data File that you repaired. Switch to the Folder List view in the Folder Pane by pressing Ctrl+6. You can create an Outlook Data File, and drag the items in the Lost and Found folder into the new data file. After you've moved all the items, you can remove the Recovered Personal Folders (.pst) file. This includes the Lost and Found folder. If you can open the original Outlook Data File, you may be able to recover additional items. The Inbox Repair tool creates a backup file with the same name as the original, but with a .bak extension, and saves it in the same folder. You may be able to recover items from the backup file that the Inbox Repair tool couldn't recover. To recover items from the backup (.bak) file, make a copy of it and give the copy a new name with a .pst extension, such as bak.pst. Import the bak.pst file into Outlook, and then use the Import and Export Wizard to import any additional recovered items into the newly created .pst file. See how to import a .pst file by reading Import Outlook items from an Outlook Data File (.pst). Mail appears in different Control Panel locations depending on the version of the Windows operating system, the Control Panel view selected, and whether a 32- or 64-bit operating system or version of Outlook is installed. The easiest way to locate Mail is to open Control Panel in Windows and then, in the Search box at the top of the window, type Mail. In the Mail Setup dialog box, click E-mail Accounts. Click the Data Files tab, select the Exchange account, and then click Open File Location. A file explorer window opens to the location of the data file for the Exchange account. The Account Settings and Mail Setup dialog boxes will remain open, behind the file explorer window. Close the Account Settings and the Mail Setup dialog boxes, then return to the file explorer window. Important Be sure to close these two dialog boxes before you delete the file. If they aren't closed, Windows may display an error message about a conflict. In the file explorer window, right-click the Exchange data file and then click Delete. The next time you start Outlook, a new .ost file is created for the account. Windows Desktop Search (WDS) indexes all data in .ost files and .pst files. However, the indexing of Outlook data occurs only when Outlook is running. Therefore, you may have to leave Outlook running overnight to determine whether performance issues are related to the building of your search indexes. Performance issues may increase when Outlook is running in online mode. Such performance issues occur because running Outlook in online mode increases the load on the Exchange server. This performance issue is especially noticeable when Outlook is configured in a nondefault state to index the items from the Exchange server to the local client index, and if more than one user indexes the Outlook data at the same time by using Windows Desktop Search. Click the search box above the list of email messages. The Search tab is enabled as soon as you do this. In the Options section, click Search Tools, and then select Indexing Status. In the Indexing Status dialog box, view the number of items that remain to be indexed. The built-in back-off mechanisms in the indexing component of Windows Desktop Search pause the indexing of Outlook data when the system is under heavy use. The easiest way to let the indexing finish is to leave Outlook running overnight. Additionally, you can reduce performance issues by running Outlook in Cached Exchange Mode. In this mode, Windows Desktop Search searches the local copy of the mailbox instead of the mailbox content on the server. Outlook cannot open the data file filename until it has been checked for problems. Microsoft Office Outlook' exited without properly closing your Outlook data file 'drive:\Users\username\AppData\Local\Microsoft\Outlook\outlook.ost'. 'Microsoft Office Outlook' must be restarted. If this error message recurs, contact support for 'Microsoft Office Outlook' for assistance. The data file filename was not closed properly'. This file is being checked for problems. When this icon disappears, the .pst file or the .ost file is reconciled. If you are running Outlook 2010, the reconciliation process will pause at shutdown and resume (from where it was paused) the next time that you start Outlook. If you see this issue frequently, and you have to exit Outlook shortly before you shut down your computer, it may be better to shut down Windows while Outlook is still running. We recommend that you do this instead of exiting Outlook and then shutting down Windows shortly after that. Your Microsoft Outlook mailbox grows as you create and receive items. To manage the space in your mailbox or on the mail server you are using, you can move old items that are important, but rarely used, to an archive location. This storage process occurs automatically with AutoArchive, but you can customize most of the default settings. Note The Archive command and AutoArchive feature doesn't appear for any account in your Outlook profile if you include an Exchange Server account and your organization uses Microsoft Exchange Server Online Archive. Your network administrator can also disable this feature. Note Items in your mailbox might be subject to your organization's retention policies or messaging records management. When applied to a Microsoft Exchange account, these policies take precedence over AutoArchive settings. The AutoArchive feature is removed from any Outlook profile that contains a Microsoft Exchange account with retention policies. AutoArchive moves items from their original location in Outlook to an archive file folder when they expire, that is, when they pass their aging period. You can also set options for items to be deleted when they expire. Items are stored in their archived locations unless you change one or more AutoArchive settings, or choose to have the items automatically deleted when they expire. If the setting is to Delete expired items, those items are not archived but are deleted permanently. Items can be automatically deleted only before they are moved to their archive location. Items that are already archived can only be deleted manually. Note Folders you create that contain the same type of items as Inbox, Calendar, Tasks, Notes, or Journal have the same default, six-month aging period. The received date/time or when you last changed and saved the message, whichever is later. The first time that you run Outlook, AutoArchive is turned on by default and runs every 14 days. You can change how often AutoArchive runs, specify the Outlook data file (.pst) used to store archived items, and choose when items in your Outlook folders are subject to being archived. Select the Run AutoArchive every n days check box, and then specify how often to run AutoArchive. Set the default folder options first, and then customize individual folder settings. Otherwise, you may unintentionally change the default settings. In the folder list in the Navigation Pane, right-click the folder that you want to change, and then click Properties on the shortcut menu. On the AutoArchive tab, select the options that you want. Click File -> Import and Export. Choose Export to a file, then select Personal folder file (.pst). Decide what to do with duplicate data in case it happens. Go with the default if you are unsure. Usually select no encryption, but if you really need it then REMEMBER YOUR PASSWORD! Select Personal folder file (.pst) and then Browse to find the file to import. Choose to import into the current folder you selected when you started or into the same folder. Be careful with the same folder option, you can clutter one of your real folders this way by accident. The Microsoft Lync client can be downloaded from here. Double click on the disc image within your downloads folder if the image fails to open automatically. Click Continue on the "Install Microsoft Lync For Mac" screen or click the "Lync Installer" button in the Microsoft Lync window. Follow the instructions for installing Lync. Click the Lync icon to start the application. This can be found either in your dock or by accessing the 'Go' menu from the Finder and selecting 'Applications.' Double click on the Microsoft Lync icon to launch the application. (1) From the Sign In window enter your email address and leave the 'Sign In as' tab set to 'Automatic'. (2) Enter your user ID. This is normally your network login credentials for the domain. (3) Enter your password and select the 'Remember my password' check box. Click on the 'Sign In' button to complete the login process. ​Note: Mac Lync 2011 passwords cannot be more than 16 characters in length. Inside the above Word folder you'll find a new file (dated 30 Jun 16) called "linkCreation.dotm". Remove this file. The full path of the Microsoft Office document includes the drive letter or server name, and all characters and folder names up to and including the name of the document. The entire path cannot be longer than 242 characters in Word, or 218 in Excel. Make the complete path to the document shorter by saving it in a location that has fewer nested folders, or by shortening the file name of the document. On a Windows Vista or Windows 7 computer, you may see a "File in use" or "File_name is locked for editing by user_name" message when opening a Microsoft Office document (e.g., Excel or Word file) in a remote shared folder in Windows Explorer that used the Details view and the Preview Pane layout. This is caused by Windows holding a lock on the files for longer than normal, which is behavior associated with the Details view and Preview Pane layout. Per Microsoft Support, the cause of this issue is a sharing violation that happens between the operating system and the Office application over a network resource. Click one of the following: Tools > Folder Options > View or Organize >Folder and search options. Clear Show pop-up description for folder and desktop items. Clear Show preview handlers in preview pane. Go to File > Options > Trust center > Trust Center settings. Go to File > Options > Trust center > Trust Center settings > Trusted Locations. Place a check next to Allow Trusted Locations on my network as shown below. Windows Vista: A HotFix is available from Microsoft Support at http://support.microsoft.com/kb/942146. The attached ZIP file contains a separate REG file for each of the registry entries below. If you can't download the attachment, copy and paste the text below into a text file and save it as one REG file. When you launch FileMaker, the default setting is this screen. It is useful if you are always creating new databases, otherwise it can be kind of annoying and confusing. So, my suggestion is to first turn off this screen. This is done by clicking the small check box near the bottom left of the screen, labeled 'No longer show this dialog'. (you can always turn it back on in the FileMaker Preferences screen). and finally, click the OK button bottom right. The IP address for the appropriate database and inside the Favorite Host's Name a meaningful name. Note: you will have to click on the Hosts: (get the IP address from your manager) line in the Hosts box for the databases to show up in the Available Files area. So now, click on the database you want on the right hand side and then click the 'Open' button. This article describes how to run a full backup from an existing script using the 'Recycle Media Set' action. It is assumed that the most recent weekly or monthly backup failed and you now need to manually rerun the script. This article only applies to Retrospect versions 8 and 9. 1. Before you can run a recently missed full backup, you need to know which script and media you are supposed to be working with. To identify the correct script and media, go to 'Activities' in the left side bar and then select 'Past' from the search criteria. Locate the date of the last full backup or current backup week. In the example above, our current backup week is WK04 and can be clearly seen from the Destination column. 2. Now click on 'Scripts' from the left side bar. Select the appropriate script and click on 'Run'. Tip: If you're unsure which script to choose, then go back to 'Activities', select the date of your missed backup and click on the 'Log' button. The first line will read 'Normal backup using <name of script>. Our example above is pretty straightforward as the script is clearly named WK0204 and it's WK04 which we want to run. 3. Select the appropriate backup media set which in our example is WK04 and then select 'Recycle Media Set' from the 'Media Action' tab at the bottom of the window. 4. Ensure that the correct media is attached to your server. 5. Click on the 'Backup' Button. If you see the a flashing tape/cartridge symbol next to 'Activities' in the side bar, then you must insert the correct media before the backup will continue. This type of backup might take several hours to complete. This information explains the requirements for using Adobe Creative Cloud software services in a corporate environment. Although the applications are installed and used locally on each computer, for the licensing to operate, it is a requirement that each client computer can communicate with the Adobe servers at least once every three months. It is also useful if the applications can access the update servers to ensure the software remains up-to-date. The two primary addresses which must have unrestricted access are listed below. In addition, please read through the attached documents within this article. They will explain the requirements for running Adobe Creative Cloud Services on a corporate network and also additional Adobe servers which should be considered for whitelisting. The following host/port combinations may need to be whitelisted when logging in with an Adobe ID to download, install, and activate licensing for applications via a Creative Cloud membership. For a comprehensive listing of all network endpoints for Adobe websites and services please click here. Please visit the Creative Cloud for enterprise website for further information. Solution 1: Update to the latest version of Creative Cloud. Sign in with the Adobe ID associated with your Creative Cloud account. Download and install the latest version of the Creative Cloud app. Launch Creative Cloud and sign in. Solution 2: Clean up cached user login information. Close the Creative Cloud application. 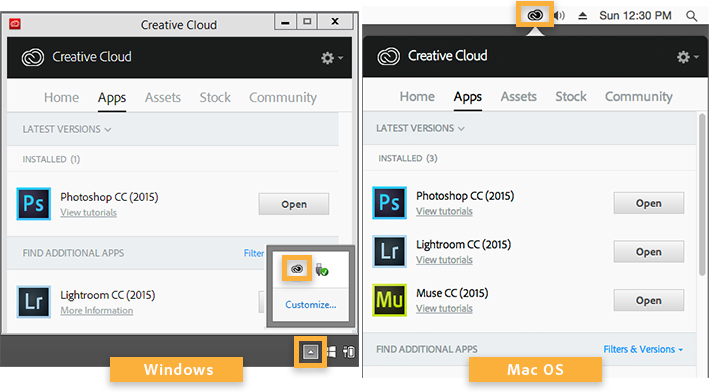 Solution 3: Reinstall Creative Cloud and clean up cached user login information. Repeat the steps from Solution 1 to reinstall the latest version of Creative Cloud. If you're using a trial, you cannot disable the Welcome Screen. We hope the tutorials will be helpful in getting started with Photoshop CC or learning about the new features available in Photoshop CC. If you're a paid Creative Cloud member, after the Welcome Screen loads, scroll down to the bottom of the New Features, Getting Started, or Tips & Techniques sections. Select Don't Show Welcome Screen Again. To display the Welcome Screen again, choose Help > Welcome. Note: In recent versions of Mac OS, scroll bars don't display by default. To turn them on, open System Preferences > General. Select Always or When Scrolling in the Show scroll bars section. If you are not able to get to the Don't Show Welcome Screen Again option, run the below script to turn off the Welcome Screen. You can view it by choosing Help > Welcome. Exit Illustrator, InDesign, and Photoshop. Download the prevent_project_hello_launching.jsx.zip file below. Remember the downloaded location. Double-click the downloaded file to decompress it. On Windows, choose to extract all files. The decompressed script is named prevent_project_hello_launching.jsx. Remember the location of the decompressed file. The Welcome Screen doesn't display until you remove the file or you view it via the Help menu. Note: In Photoshop CC 2015, you can disable the Welcome Screen by going to Preferences > General and placing a check mark in the box next to "Do Not Show Welcome Screen On Launch." The Welcome Screen doesn't display for people who are not signed into their Creative Cloud account with their Adobe ID. Instead, you see a dialog box that says "To use the Welcome dialog, please sign in to Creative Cloud." The Welcome Screen also does not display if you have something other than English set for the user interface language in Photoshop. Determine if the computer or Photoshop is frozen. Move the Welcome Screen by dragging the title bar. Close the Welcome Screen by clicking the close button. If you cannot do any of the above, see "Welcome Screen is frozen". If you can do any of the above, the computer has not frozen. If the "Welcome Screen is blank or content takes a long time to display", see Welcome Screen is blank. The Welcome Screen could appear to be frozen, but is actually taking a long time to display. See the sections below to determine if it is frozen or not. Solution 1: Clear your recent files. If the Welcome Screen is frozen, try closing the Welcome Screen. If you can close it and keep working in Photoshop, it could be that a file you recently opened contains characters that can cause this issue to occur. Choose File > Open Recent > Clear Recent File List to remove this data from Photoshop's history. Solution 2: Update or disable your virus protection software. An old or damaged version of virus protection software can prevent the Welcome Screen from displaying. Temporarily disable your virus protection software, and see if the Welcome Screen opens normally. If it does, reinstall or update your virus protection software. The Welcome Screen is HTML-based. Anything that can affect a web page loading can also affect the Welcome Screen, including virus scanners, firewalls, and network connection issues. Solution 1: Close the Welcome Screen and work in Photoshop. The Welcome Screen might not be frozen, so try to close the Welcome Screen and continue to work in Photoshop. Solution 2: Reset your preferences. Solution 3: Update or disable your virus protection software. The following URLs are used to download the content of the Welcome Screen. If they are blocked, your Welcome Screen remains blank. While a network connection is available, the Welcome Screen attempts to use it to update content. If there is any form of network security which blocks any part of this communication, the Welcome Screen will not load. If you are not connected to the Internet at all, the Welcome Screen loads using preinstalled offline content. If the Welcome Screen loads while disconnected from a network, it means a form of security not mentioned above may still be blocking the Welcome Screen. See Troubleshoot Connectivity Issues for further steps. Mac HD > Applications > Adobe Application Name > Look for a Presets folder or similar. InDesign continues to crash each time you try to re-start. Documents can become damaged while working on them in InDesign, or they can contain damaged information, for example, due to hard drive or other disk read/write errors. The situation can occur when InDesign opens the file initially, but then cause a crash because InDesign tries to read or write from or to a damaged portion of the file. The InDesign document recovery feature tries to automatically open InDesign documents which were open during the time of an application crash. If the document it is trying to open is damaged, then it can cause InDesign to crash each time you restart InDesign. Remove the file or files from the document recovery folder. Move these files to your desktop, and attempt to recover them using the methods described in, "Troubleshoot damaged InDesign documents" (TechNote kb403982). You can change the document recovery folder in the user preferences. The default path is listed below, but check the location in Preferences > File Handling > Document Recovery Data to be certain. Go to the C Drive, programdata folder and the Sage Payroll. Check the paydata text file to ensure that paydata still points to the C Drive>program files where the application is stored locally. Now launch Sage Payroll. You will need to enter your serial number and license details. Sage technical support will provide this if they are lost. Once the licensing has been entered, you will then be able to enter the company data location. You can do this by either browsing to the correct location or entering the folder path manually. Sometimes, websites don't look like you expect them to  images might not appear, menus might be out of place and text could be jumbled together. This might be caused by a compatibility problem between Internet Explorer and the site you're on. Sometimes, this can be fixed by adding the site to your Compatibility View list. Tap or click the Tools button , then tap or click Compatibility View settings. Under Add this website, enter the URL of the site you want to add to the list, then tap or click Add. Before starting it is recommended that you make a complete backup of your existing Firefox profile in case something goes wrong. Please read the Back up and restore information in Firefox profiles article for instructions on how to do this. For information on how to create a brand new Firefox profile, please read the Use the Profile Manager to create and remove Firefox profiles article, paying specific attention to the Creating a profile section. Note: Firefox must be closed down while copying files between profile folders. Under the Application Basics section, click on Show in Finder. A window with your profile folder will open. Click the menu button and then click Quit . Hold down the Ctrl key while you click on a file you want to copy and choose Copy. Hold down the Ctrl key while you click inside the profile folder and choose Paste Item. Repeat steps 4-6 for each file you wish to transfer over to your new profile folder. This file contains all your Firefox bookmarks and lists of files you have downloaded and of websites you have previously visited. For more information see Create bookmarks to save your favorite webpages. key3.db - This file stores your key database for your passwords. To transfer saved passwords, you must copy this file along with the following file. This file stores the search engine data. For more information see Use the Search bar in Firefox. Your Mac must be running OS X 10.9 or newer. Click on 'download FileZilla Client' and then the 'download' button from the FileZilla column on the next popup window. Once downloaded, go to the downloads folder (from the Finder, 'Go' menu and then 'Downloads'). Open the FileZilla image file and double click on the FileZilla start icon. FileZilla will now begin to install on your Mac. Skip the additional offer during the installation. The installation only takes a few seconds. Once completed, from the Finder, go up to the Go menu and select Applications. You'll find your new copy of FileZilla located here. Double click on the icon to launch the application. Only 64bit versions of Windows 7, 8, 8.1 and 10 are supported. Once downloaded, go to your downloads folder and double click on the FileZilla bundle icon. start icon. Click on run, agree to the terms, leave all other options on their default settings and press next through-out. Do not install the additional software when asked to. Uncheck any boxes for additional software before proceeding. See the image below for an example and expect at least two separate offers. FileZilla will now begin to install on your computer. The installation only takes a few seconds. Once completed, the software will automatically launch. Alternatively you'll find the software located in the Windows Start menu. These instructions explain how to setup a new securely encrypted site connection using the popular FTP client FileZilla. Launch Filezilla on your Mac or Windows machine. Now open the site manager by clicking on the icon located in the top left-hand side of the main window. When you have opened this, you will see another window where you can create and manage your FTP sites. Click on the 'New Site' button located in the bottom left of the window. Provide a site name and then complete the fields on the right. Host = The IP address or host name provided by your IT administrator. This will look like 123.123.123.123 or ftp.companyname.com. Once completed, click on connect. The site information will be saved and a connection will be initiated. An Unknown certificate window will appear. It's unknown because your computer has only just been introduced to it. The certificate provides information as to the session security details, the common name of the registered address and the certificate issuer. Once you are satisfied, check the two boxes at the bottom of the window for 'always trust certificate in future sessions' and 'trust this certificate on the listed alternative hostnames'. Click 'ok'. The connection is now established. Typically the FTP server folders are located on the right side of the window and your local files are located on the left. You can drag files between the two locations in both directions. This article explains how to import pre-configured site settings. The settings will be bundled within a single XML file and contains all of the connection details required to access an FTP site. These instructions are identical for both Mac and PC. (1) From within FileZilla, go to the File Menu, go to import and locate the settings file. Then click on the 'open' button. (2) The Import settings dialog box will appear, leave the Site Manager Entries box checked and click on the 'ok' button. (3) A status box should then appear stating that the import has been successful. (4) You can access the newly imported site by going to the File Menu and then Site Manager. If you would like to rename the site, this can be easily done by selecting the site from within the sites list on the left, and then clicking on the rename button from the bottom of the window. (5) All of the settings are saved so you may now connect to the site.